With the INTERREG IVB  project FOKS the City of Stuttgart developed the methodology of integral groundwater investigation further towards the preparation of a holistic groundwater risk management strategy for the area of the city district Stuttgart  Feuerbach. The project started with the development of a profound understanding of the relevant underground processes and setting up a groundwater flow and transport model. Based on this and by combining a wealth of innovative characterisation methods the water authority succeeded to identify liable polluters and to quantify their input to the overall (regional) contamination pattern even in very complex cases. In a next step the effectiveness of different remediation scenarios has been evaluated by simulation with the transport model, taking also the overall contamination pattern into consideration. 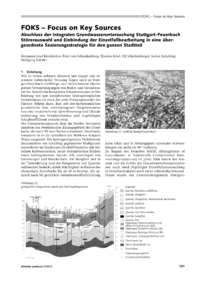 The groundwater remediation and risk management strategy finally achieved will effectively improve the groundwater quality in this part of the catchment area of the mineral springs of Stuttgart  Bad Cannstatt.